As winter and cold weather approaches, children’s play is often limited to the indoors. 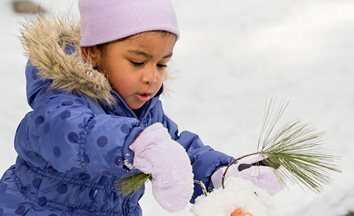 Adult fears about safety and negative attitudes toward exposure to cold weather are the barriers that prevent children from accessing play in winter months. 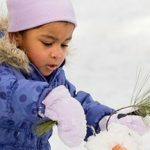 It is common to hear adults say that “my child will not like being in the cold weather,” or “the cold is too dangerous to play in,” or “there’s nothing to play with.” It is up to adults to focus on the importance of children’s play, regardless of the season. After all, play should not be restricted to warm weather. Let’s welcome this upcoming winter season with a playful attitude. When the weather drops into the single digits, it is common for parents to want their children to stay indoors to play. 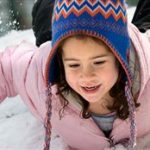 Before you go and curse the cold weather for keeping your playful children indoors all winter, let’s consider all of the benefits that cold weather has when it comes to children’s health, development, and well-being. During the summer months, children become used to the warm, green climate that the season has to offer. After the change in season or the first snowfall, children view their environment through a different lens: fallen leaves, brown grass, snow, ice. This new lens enables them to imagine the outdoors differently and to be creative and play in different ways. The winter months provide us with different ways of moving our bodies, such as sledding, walking up a snow hill, or building a snowman. Our larger muscles are put to great use in the winter months due to the challenges that snow provides. This large-muscle use and increase in physical activity support children’s gross motor development and overall health. Most adults associate the winter months with getting colds and illnesses such as the flu. However, it is not the cold weather that necessarily causes colds and flus—it is increased exposure to indoor environments where bacteria and viruses live. For example, during the winter months, you turn on your home’s heating and venting systems. The bacteria and viruses within your home are continuously being moved around inside. Adults and children who spend long periods of time in a heated and poorly ventilated home, without exposure to fresh air, can easily pass germs to each other. 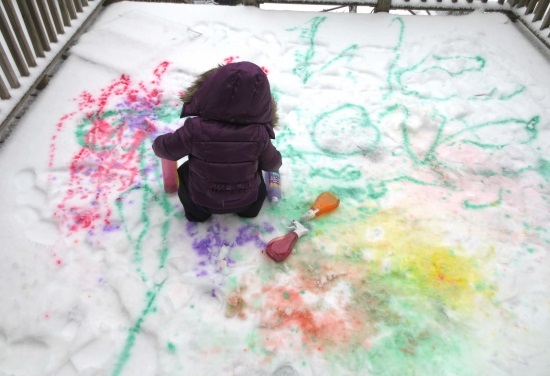 Weather that we consider “messy” provides environments and materials that are inspiring and fun for children; for example, patches of ice, large snow hills, and trees covered in snow. These environments provide children with opportunities for new challenges, such as sliding down the ice patch and climbing a snow hill. Engagement with outdoor environments in the winter provokes new problem-solving skills—“How can I slide down this ice patch without falling?” “How fast can I run up this snow hill?” “Can I climb this tree using a branch as a snow pick?” The ever-changing environments that the winter months have to offer provide children with the challenges that they so often crave. When we stay indoors during the winter, we are not only missing out on play, but also on necessary vitamins that the outdoor environment gives us. Children get vitamin D through sun exposure, and absorb it even though the sun is not as warm in the winter. Vitamin D helps regulate mental and emotional moods, doing so by increasing serotonin levels in the brain. Serotonin plays an important role in regulating mood and keeping us happy. So the more exposure you have to the sun, the higher your serotonin levels will be. It is recommended that you get at least half an hour of playtime outdoors in the winter. Sometimes we think of winter as being a time of “nothing to play with” because everything is covered in snow. Parks may be empty, local outdoor events may decrease, and items that we use in the summer months may not be practical anymore. 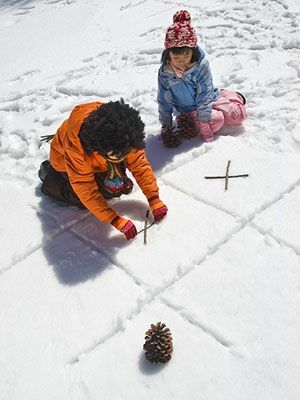 However, creating and engaging in winter play activities is actually fun for both you and your child, and very easy to do! Here are some activities that you and your child can do in the backyard with very little prep or materials to buy. 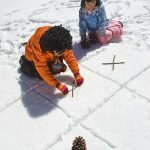 Snow Flag – Tie white cloths to the end of sticks and hide them around a snowy area for the kids to find. 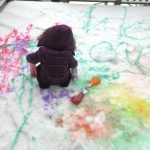 Spray Paint Art – Fill spray bottles with water and food coloring and draw in the snow. Target Snowball – Hang a target in the tree or lean against a wall and let the children take aim with snowballs. Snowflake Magnifying – Use black construction paper and put snow on top of it. Let the kids use a magnifying glass to look at the different snowflakes. Frozen Bubbles – blow bubbles outside in the cold air. They will be much harder to pop and they last longer. Light Snow – Hide and play with glow sticks in the snow, it creates a fun contrast.